"Our Strong Future" was on everyone's mind during the 2011 Trigard Convention. The Darby family shared what that future hold for Trigard. Rich Darby, Chief Operating Officer, spoke about the importance of creating experiences for families. "It's not just about the boxes," he emphasized. "We have to create something that families will connect to and remember." Case in point? 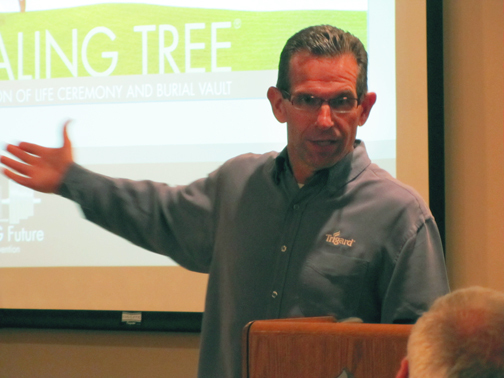 The success Trigard dealers have seen with the Healing Tree burial vault. Not only does it add graveside value, but it helps families begin to heal. proud to be family-owned and operated. Donna Walthall, Chief Financial Officer, talked about another part of the Trigard's future: the next generation of the Darby family. She introduced her daughter, Lindsey Murphy, and son-in-law Jason Murphy, Rich's sons Ethan Darby and Ross Darby, and Linda's step-daughter, Megan Sempsrott. 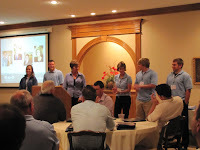 All five are working in the family business and are proud to be a part of Trigard's future.